"Annie Wilkerson is Moose Creek’s premiere horse trainer and equine columnist for Montana Living. Money is tight as she tries to put her kid-sister through college and provide for her young nephew. When Annie’s column is cancelled, she’s given first shot at a new lovelorn column—and she can’t afford to turn it down. Only problem is . . . Annie’s never been in love. Always resourceful, she reluctantly strikes a deal with the town’s smooth-talking ladies’ man Dylan Taylor: She’ll work with his ailing horse, Braveheart, if he’ll help her answer the reader letters." What's better than a book about a handsome cowboy? A book with a handsome cowboy getting to know a control freak woman while they work together to dispense love advice to the lovelorn. Honestly, while I love romance books, those of a strong Christian nature aren't as often on my bedside stand. I picked this one up and after admiring the cover (I love a good cover. ), I started reading. I didn't manage to stop that first night until I was halfway through. 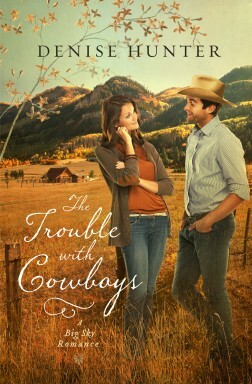 To celebrate the release of The Trouble with Cowboys, Denise is hosting a fun Author Chat Party on Facebook. She'll connect with readers and give away some amazing prizes - including a Kindle Fire! Want to learn more? Check out more stops on this blog tour! I received a free copy of this book for the purpose of this review. All thoughts, comments and typos belong 100% to me.